When a trip to Thailand became the catalyst for a wildly successful eCommerce business with a unique social purpose, the founder of this fashion and lifestyle brand knew he had a valuable product line to share with the world. Today, the company has thousands of happy customers and donates a portion of every sale to the African Wildlife Foundation and its Say No Campaign. 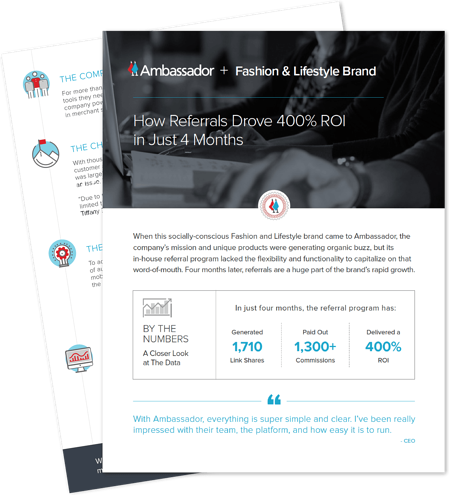 Given the shareability and viral nature of the brand and their Instagram-worthy products, the company knew referrals and word-of-mouth would be key components of its growth strategy. So, early on, the company built a basic referral program in-house. The problem? While that program delivered some results, it lacked the flexibility and functionality to customize referral incentives and commission structures, and it wasn’t set up to scale.